Too often, homeless hostels are more of a revolving door than somewhere to reboot your life. But a new kind of housing complex supported by local co-operatives offers not only accommodation, but support in developing life skills to stay off the streets. It’s Christmas Day, 1998, and I’m surrounded by Belfast’s homeless. The first day at my new job as a support worker with a local hostel for 16-25 year olds isn’t quite what I expected – the homeless, I find, are in good spirits. The Shloer is flowing freely and there’s a seemingly bottomless tin of Quality Street getting passed around. I’m playing pool with a guy called Michael who’s around my age and into similar things that I’m into. The craic is good, as we say around these parts. But this honeymoon period was to be short-lived. Hostel life was not what I experienced that first shift on Christmas Day; the reality of the place being more of a revolving door than somewhere safe and secure to reboot your life. I would find myself doing a new resident’s induction at the start of the week, only to come back at the end to find they’d been evicted. Rules were too easily broken; life at the hostel more akin to life at a children’s home than to anything resembling adult life. In fact, those who managed not to break any of the (many) rules, who were successfully resettled, often struggled to maintain their tenancy – perhaps for this very reason. Before long, they found themselves back at square one, homelessness becoming something of a sub-culture with many of the same people moving through the system again and again. I spent over ten years working within the community and voluntary sector of Northern Ireland with almost every job I had in that time involving work to tackle homelessness, address housing need and help clients get resettled. Northern Ireland has its own particular challenges in this area, the added dimension of The Troubles a significant factor in why someone might present as homeless (intimidation, paramilitary threat) as well as limiting where they can resettle. But when I moved to Cardiff just over 5 years ago, I found that homelessness was just as much an issue in Wales. If anything, street homelessness seemed even more rife and it seems to be on the rise: the latest figures published by the Welsh Government suggest that rough sleeping has gone up 30 per cent over the last year or so. And just as I saw in Belfast, part of the problem is to do with the nature of provision as opposed to the number of beds available on a given night. Such an approach can be seen at Ty Cyfle, a housing complex aimed at 16-25 year-olds in Torfaen. 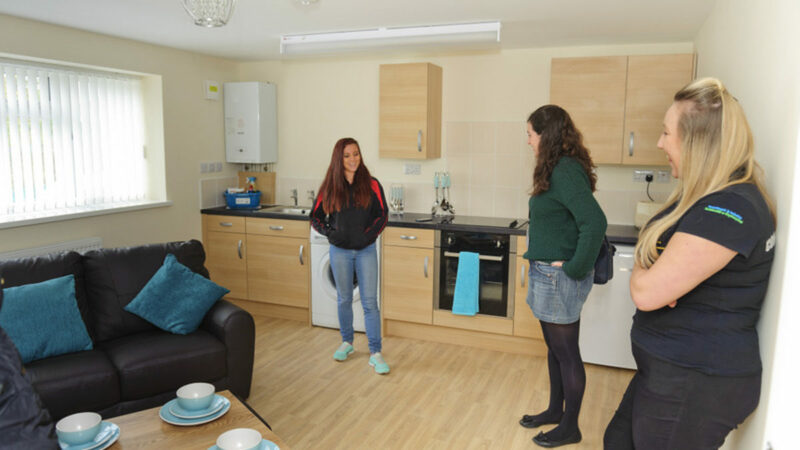 Set up by Bron Afon Housing and supported by the Co-Operative housing project, Ty Cyfle offers not only accommodation, but support in developing the life skills needed to maintain such. This provision is aimed at 16-25 year olds and pitched somewhere between “a hostel and full ‘regular’ tenancy,” according to Maria Jones, Bron Afon’s young people & families manager. “Tenancies were failing for various reasons, many of which were avoidable,” she recently told the Wales Co-Operative Centre. “We developed a project with young people called ‘Own 2 Feet’. We ran workshops on what they wanted to do, they devised them. Such work would hopefully be supported by the Welsh Government, David reckons, given their recent commitment to “develop and promote new ways of providing land and funding for housing, such as community land trusts, mutual home ownership and co-operatives” part of which is aimed at helping people “find homes to suit their circumstances, to introduce flexible tenure arrangements, and to support social housing tenants to participate in the running of their homes and services”. Susan Elsmore is a Labour & Co-Operative councillor in Cardiff with an ambition to end rough sleeping in Cardiff. I was interested to hear how she finds things working on the ground right now. She advised me of new measures they’ve introduced alongside dedicated partners. “So, for example, you mentioned young people, particularly those leaving care. We’ve set up arrangements whereby they are supported by specialist third sector organisations and our own staff; introduced to ‘training’ tenancies whereby they’re encouraged and empowered to manage their affairs independently, but with support. The idea being that at the end of the training, they’ll be ready to sign up as tenants.” Susan recognises the need for services that deal with more complex needs, such as substance misuse or mental ill-health, and in particular how the housing and health sectors need a more joined-up approach. Again, for her co-operative principles are key here. This was something that I certainly saw too much of back in Belfast. One particular organisation I worked with – a mental health charity – encouraged staff to measure success by the amount of money generated by each client’s ‘engagement’. The client’s individual needs were a secondary concern, if considered at all. I’d very much like to believe this type of approach was in the past. Of course, like David and Jennie, Susan feels there’s still more work to be done, but she’s confident that co-operative principles are key to achieving real results. “In Cardiff we are now using a case a management approach to all individuals sleeping rough,” she tells me. “This is producing early results – we have one individual in particular, an entrenched rough sleeper for 17 years, now in accommodation for 3 months.” Given the progress to date, David is hopeful that the worrying spike in homelessness in Wales can be effectively reversed and, like Susan, that co-operative measures will be a key part of that process. “I was genuinely impressed by what I experienced at Ty Cyfle. As a housing model, I feel it has a lot of potential and shows how housing associations can embrace this approach and provide real, tangible benefits for their tenants.